How long have I been a Leather Doctor? The variety in work, from cleaning to repairing and re-colouring leather and vinyl furniture, cars, boats, jacket, handbags… the list goes on! What did you do prior to becoming a Leather Doctor? I’ve been a courier, a bus driver, a service advisor, warranty clark, workshop controller, limo driver, tour bus driver, qualified heavy vehicle brake mechanic and much more. What Leather Doctor territory do you operate? 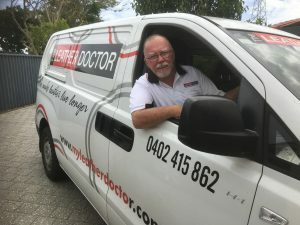 I own The Leather Doctor Fremantle, which is in Perth, Western Australia. What have you been able to achieve via your time as A Leather Doctor? I’ve achieved satisfaction in working for myself but with the support of Leather Doctor. I’m skilled in cleaning and repairing leather and vinyl, whether it be on cars, boats, furniture, clothing and handbags and because I also own a Fabric Doctor license, I can also clean and remove stains from fabric lounges. What advice would you give to someone looking to purchase a franchise/operate a franchise? My advice when looking to purchase a franchise is do your due diligence – ask as many questions as you can and go out with a Leather Doctor for a few days to see the type of work that they do. What’s the most interesting job you’ve worked on to date? I had the pleasure of working on the largest trimaran super yacht in the world that was built here in Western Australia. At 84 metres long, and at a cost of over $180 million dollars, the White Rabbit Golf was amazing to work on. What do you love most about being a Leather Doctor? I love the independence of working for myself and the variety of work – no two days are the same! I have a commercial drone pilots license. To increase my turnover by at least 15%, which means getting lots of new customers and making more people aware of my skills and services! Great guy and great service. I recommend Paul Shipp, the leather Doctor to anyone wanting the best in leather maintenance, cleaning and repairs.